Part of REGUA’s mission is to restore habitats in the Guapiaçu valley that have been cleared for timber, agriculture or damaged through poor management practices, using locally sourced seeds and materials. This includes reforesting cleared areas to create forest corridors between existing forest fragments. Although most of the higher areas in the Guapiaçu valley clear-felled in the last century have naturally regenerated, some of the lower slopes and pastures have shown little change in the last 20 years and have become covered in the tough grass Imperata cylindrica. This grass is a climax species and is common across the tropics. It forms a dense mat of roots and grass blades almost a metre high, preventing sunlight from reaching the ground and therefore other plants from becoming established. For REGUA to achieve its objective of restoring the natural vegetation throughout the reserve and especially the lost wetland tabebuia forest, then it concluded that it has to take a more proactive approach to habitat restoration. 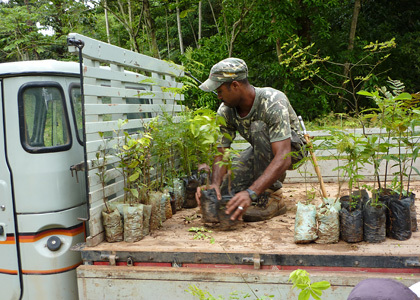 The vast majority of the trees planted at REGUA are grown from seeds collected year round from the forest on the reserve by staff and volunteers. 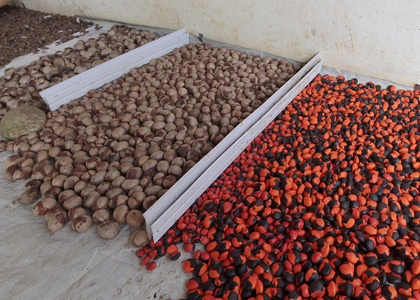 Seeds of about 180 tree species are collected, including pioneer trees and longer-lived successive species such as figs and Tabebuia cassinoides – a very rare wet forest tree that is endemic to the Atlantic Forest. 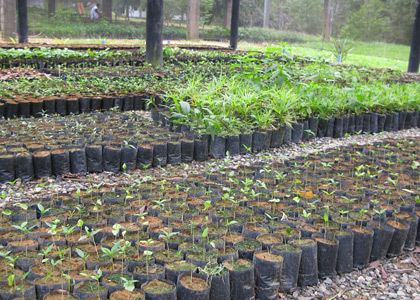 The seeds are then germinated and the saplings nurtured in our purpose-built tree nursery, run by Head of Nursery, Mauricio Noqueira, assisted by Marli Oliveira da Conceicão. The original nursery, built in 2005 near the start of the Forest Trail (Brown Trail), could produce around 20,000 saplings a year and was gradually expanded to accommodate more trees, before relocating in 2012 to it’s present location near the reserve entrance. 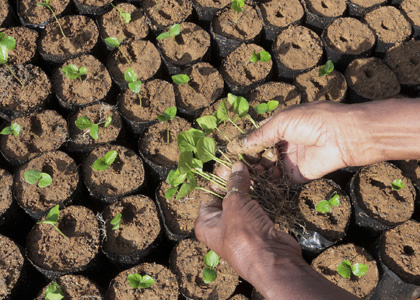 The nursery can now provide around 70,000 seedlings a year. Whilst some of the earlier reforestation areas were on lowland close to the nursery and easily accessed by tractor, the more recent areas have been further afield on steep slopes covered in grass, representing more of a challenge. Until the trees become established they have to be cared for to prevent attack from leaf-cutter ants, the area around the sapling has to be weeded, and in prolonged periods of drought need to be watered. Although this approach is very resource intensive it has delivered a 95% survival rate, which is considered very successful. Typical planting density is at about one tree per six square metres, and the ideal planting season is from October to March, when the austral winter rains arrive. The growth rate of the trees planted has been measured and monitored within several defined parcels. 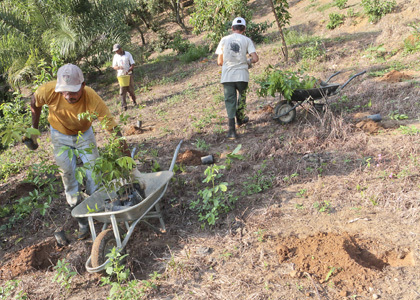 By regularly measuring these trees REGUA has been able to improve its planting and cultivation techniques. These studies have shown that in ideal conditions about 25% of the trees planted grow to ten times their original size in only two years. At the close of the 2014/15 planting season REGUA had planted 336,296 native trees over 265.46 hectares, way more than ever thought possible. REGUA aims to plant another 10,000 trees over 6 hectares before the end of 2015. Most of the funds for REGUA’s tree planting work have been provided by the World Land Trust, Chester Zoo and The Body Shop International in the UK, along with other donations from SOS Mata Atlântica, Iniciativa Verde, Ornitholidays and The Seo Taiji Fandom. With further funding REGUA could increase its efforts to restore the Atlantic Forest of the Guapiaçu valley and reconnect more of the existing forest fragments. Please help restore more of the Atlantic Forest by making a donation.